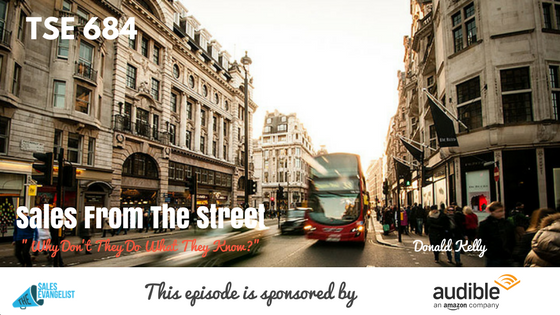 TSE 684: Sales From The Street-"Why Don't They Do What They Know?" Here’s a self-check question for you: What don’t I do what I know I should do? Today, I’m sharing with you the concept behind this. You know how to do cold calling. You know how to prospect. You already know how to utilize LinkedIn. You’ve probably learned something about social selling. Or you’ve listened to podcast and webinars. You’ve watched training and read books. And the list goes on. The content is being delivered. No doubt about that. It’s going to the source. It’s being understood and it’s being grasped by the most part. They don’t have it ingrained in them. It’s been proven there are two sides of our brains – a fast brain and a slow brain. Daniel Kahneman describes it in his book, Thinking Fast and Slow that we our fast-thinking brain makes up our subconscious. It does things on its own like when you get up in the morning and you just automatically tie your shoe without really thinking about it anymore. Moreover, Charles Duhigg writes about building a habit in his book, The Power of Habit. Again, we make use of our subconscious mind and do the things we do without thinking. For instance, you’re driving home without using your map because you don’t need it. It’s just a part of you. It’s something you already know. This is the reason Steve Jobs wears the same style of shirt and jeans over and over. He doesn’t have to think anymore. Why waste brain power in that? The idea is to build those habits. Now the slow brain is the cognitive part of thinking. When somebody gets on the phone and asks you a question, you’re trying to figure out what to say next. Sellers may stumble if they’re not as educated as a seller. Examples of this include doing your taxes or building a deck in the backyard or you’re researching something. You’re forcing your brain to do something you don’t normally do. And sometimes, we go back to our way of doing things because we follow old habits. So when sellers go through all this training, our slow brain says yes, we’re going to do it. It does make sense. We write it down. We understand the process and strategies. This happens on a Friday. Then Monday comes. We go to the office. We go to the coffee machine or the break room. We go to our desk. We see our emails. We go back into our same old habits. Basically, everything we learned on Friday is totally gone. Out of the window! The key is to build habits. You have to build habits with your sellers. When looking into training programs, make sure it’s not just a one-time thing. But it’s something that will help them over a considerable amount of time for them to be able to change their habits. Or in a way that they learn things bit by bit through the slow brain process. With my clients, I give them a six-week training. Then they get enrolled into TSE Hustler’s League so they can digest more content. After which, they familiarize themselves over and over. Soon, positive habits begin to form. And the culture begins to change. Essentially, our fast brain begin to pick up these ideas and these become habitual for us. Some of the main areas where sellers have the biggest difficulties with in terms of the things they know but still don’t know it – is with the daily planning. They go out and just wing it. Follow an effective sales process. Help them follow a process that helps build habits for them. 2. They don’t have a how to their why. Sure you know your why, but without knowing how to go about doing that, your why becomes useless. Agree? 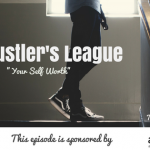 Say amen to this episode and send me a text message at 561-463-2531.